An overall view of basic and premium services provided to winners. You can view all the services after you login. all the winners can use the A'Award Badge for promotion of their designs and products. From the basic services panel you can access tools such as the "Press Release Wizard", an automatically created press release that you can send to your relevant press contacts, "Labels" that you can use to indicate the quality of the design, plus documents on "Copyrighting and registering a product", "Making a patent application", "Advertising and communicating winner designs or products", "Reaching companies" etc. Winners have access to the "A'Design Award Badge" that you can use to communicate the quality of your product and designs, you can download all the necessary files for the badge in the winner services page. In addition to the badge, we have also created a widget that you can put into your webpages, when clicked the widget goes to a special page showing statistics of the competition and your winners certificate with the winning design. "Winner Certificate" is given to all the winners and they can also be accessed anytime after the competition. You can download and print additional certificates for internal and external communication in subsidiaries, shops and outlets. 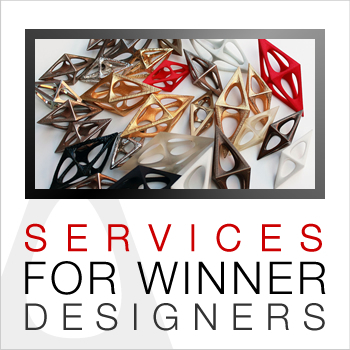 Consultancy services for winners services include : "Preparing a custom press release", "Copyright and patent application consultancy", "Service for winners to sell their designs to companies", "Advertisement campaign consultancy", "Custom webpage design and promotion" etc. These services may require an additional fee, but there is always counterpart documents in the basic services panel so that you can do everything here by yourself. With your request, A'Design Competition will help you get in touch with business consultants, agencies & institutions supporting innovation, venture capitalists and angel investors, distributors and retailers of design, original design manufacturers and design oriented companies, brand owners and big companies, prototyping and model making companies, research and development organisations, end buyers and users of designs and products, engineering and precision engineering companies plus intellectual property lawyers. The contact information for these companies will also be available online. Most of the services are indeed passive services, which means that you do not need to take action to activate; for example we send the press releases for all the winners without any additional costs. In addition the winners are published in our yearly ResultBook, on top of that, all the participants are given a free online portfolio sponsored by Salone del Designer where they can communicate their designs online. We send the ResultBooks to design-oriented companies to increase the potential for the companies to contact designers. Winners are also admitted to the Association of Designers free of charge. Some select designs might also be exhibited in our prototype museum and gallery. The A'Design Award will also present itself in design oriented trade-fairs around the world, winners will got chance to be promoted in these fairs. DesignPRWire is a public and media relations agency for design. They provide integrated multidisciplinary communication and marketing services to A' Design Award winners such as: 1. Press Release Preparation with Rich Media Hosting. 2. Press Release Distribution to Media Outlets, Magazine Editors and Press Members. 3. Press and Media Relations through Direct Communication with Important Press Members. 4. Newsletter Communication through Design-PR.org to opt-in registrants. 5. Micro/Splash Website Development for Campaigns with Search Engine Optimization. 6. Direct & Pitch-in Advertising for Campaigns at Popular Media Channels. 7. Manual Submission of Your Designs to 500+ Design Blogs, Design News Indexes and Portals etc.